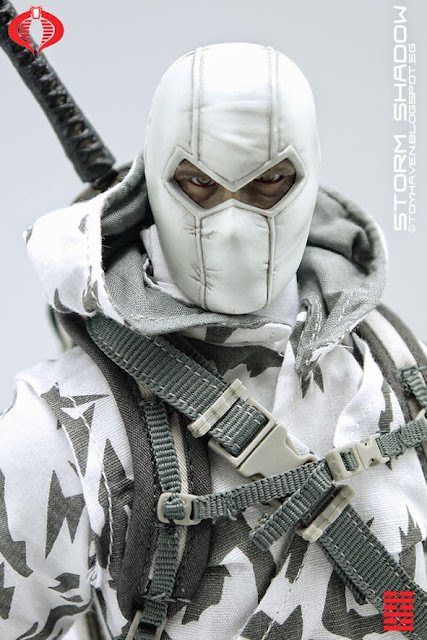 This will probably be my last toy blog post and review of the Sideshow Collectibles COBRA Ninja Assassin 1/6 scale Storm Shadow 12-inch figure... for now. This is such a great figure with so many posing options and combinations that I had a lot of fun posing him and taking pictures. We don't play with toys like when we used to when we were kids but collecting, posing action figures and taking pictures of them is also very enjoyable, at least for me so I'll just keep on keeping on racking them up and shooting them and posting the pictures on my toy blog site for anyone who is interested and care to take a look. Comments are always welcome :) I've certainly made quite a few friends along the way. 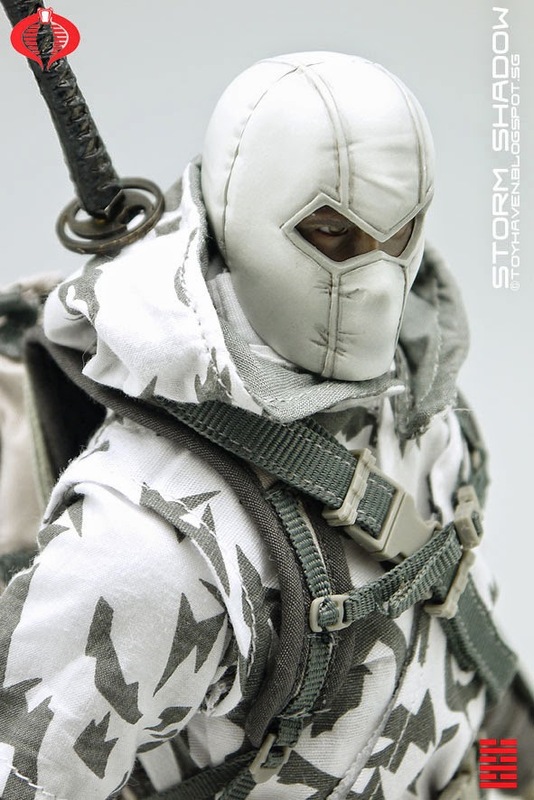 This isn't the first Storm Shadow sixth scale figure from G.I. 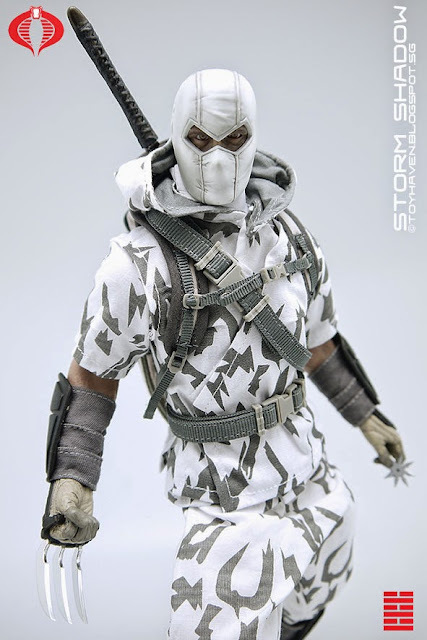 Joe: A Real American Hero toyline to be released by Sideshow Collectibles but IMHO it is the BEST 12-inch Storm Shadow figure by far from Sideshow. 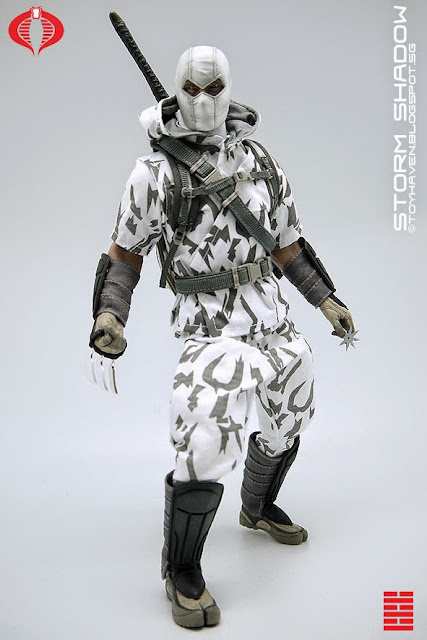 Interestingly enough, the first Storm Shadow looked more Japanese / Asian than this latest version. Anyway, according to wiki, Storm Shadow's real name is Thomas S. Arashikage (トーマス・嵐影) (Arashi meaning "Storm" and kage meaning "shadow" in Japanese), a Japanese American. In these pictures posted on my toy blog, you see Sideshow Collectibles 12-inch Storm Shadow figure with the claw right hand and shuriken holding left hand that are included with this boxed set. You can see all the 1/6 scale gear and accessories in my part 1 review posted HERE. 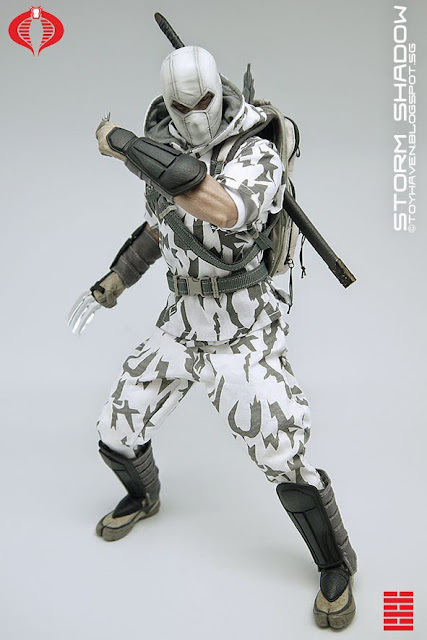 Part 2 review (pictures HERE) was Storm Shadow with his katana and tonfus followed by the third part review of this COBRA Ninja Assassin with his compound bow and arrow (see the previous post HERE). The origin of Tekko-Kagi (claw) was a farm implement. 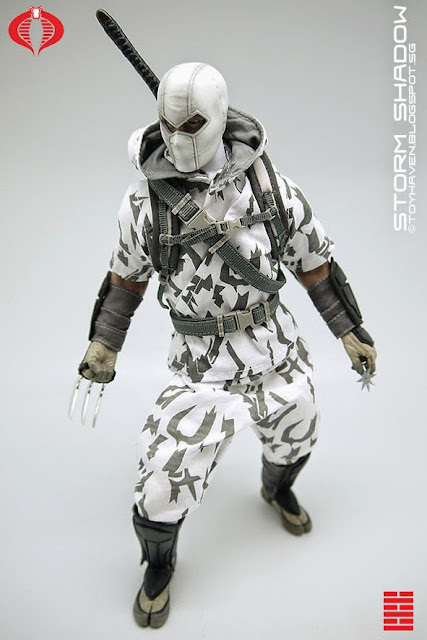 It is kind of a sickle to reap weeds. 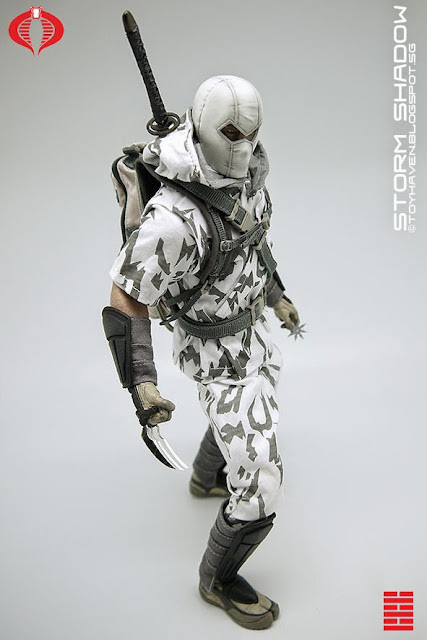 The speciality of Ninjas consists in the point that, everything around them can be made and used as weapons. The shape of Tekko-Kagi is that, on the oval metal ring, four iron edges like bear claws are attached. 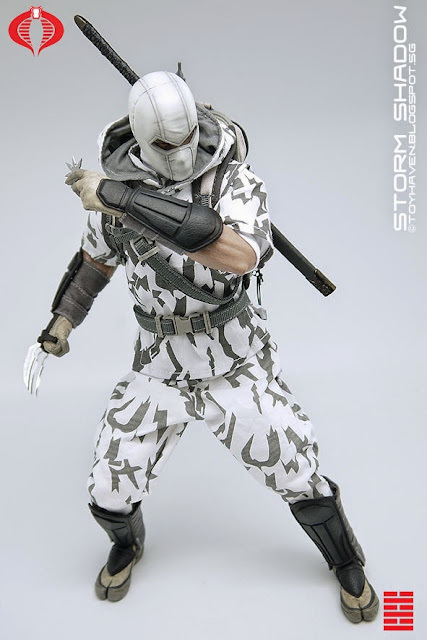 When using, a Ninja grasps the oval ring and scratches his enemy with the edges. 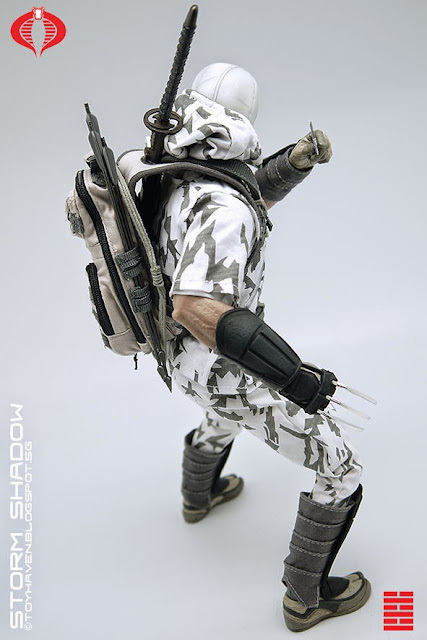 In this modern version of the Tekko-Kagi, the claws look very similar to those of Marvel Comics Wolverine. 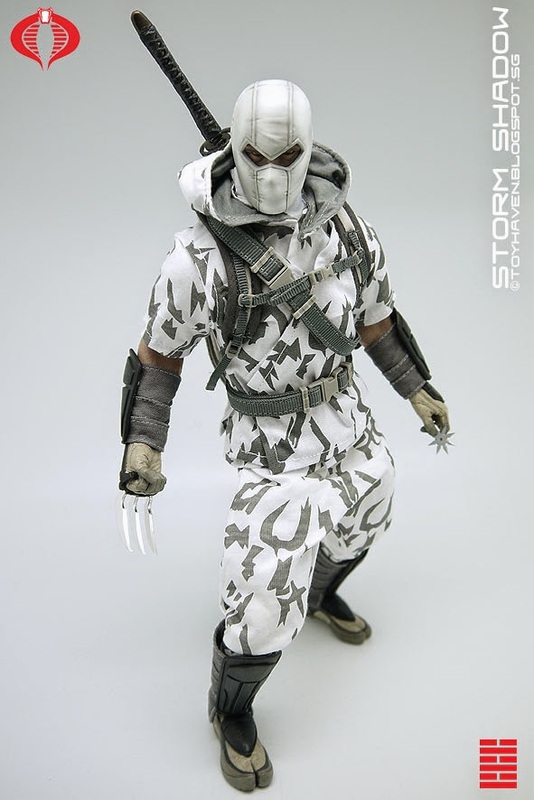 Check out my post HERE with comparison pictures of four 1/6 scale Wolverine figures from Medicom Toys (two), Hot Toys (one) and kitbashed Wolverine (one). 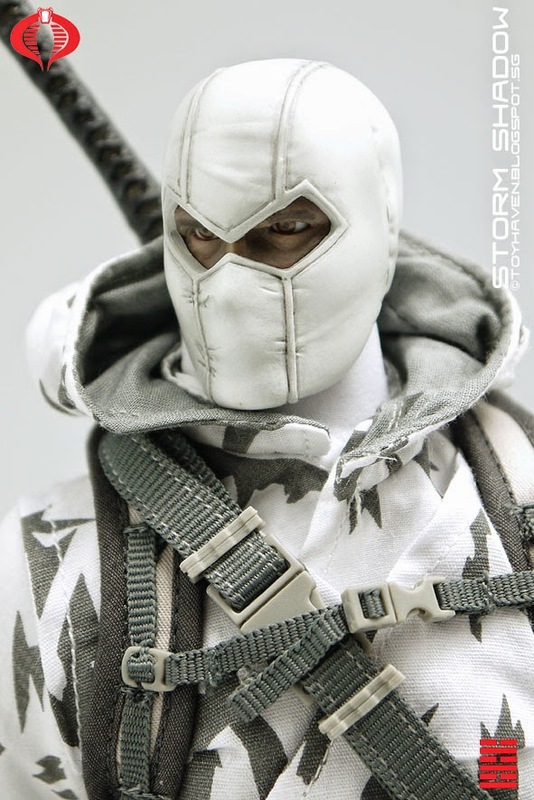 Close-up pictures of the Sideshow Collectibles 1/6 scale Storm Shadow head sculpt. Storm Shadow comes with white balaclava molded on and while it's nicely done, it does seem a bit too thick. 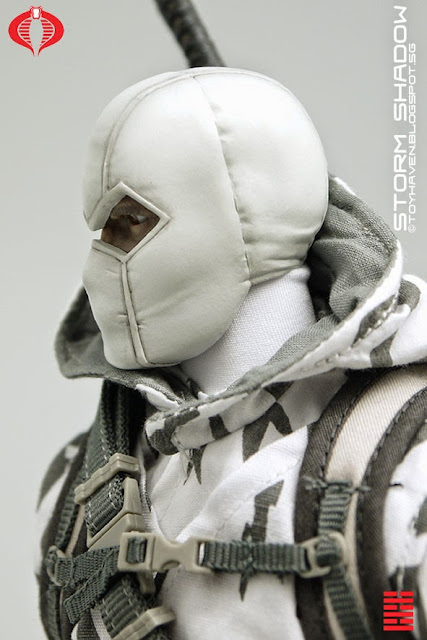 When you view the slits where the eyes are showing from the sides, you can see how thick the molded portion is. If it was cloth as it should be, then it shouldn't be so thick. 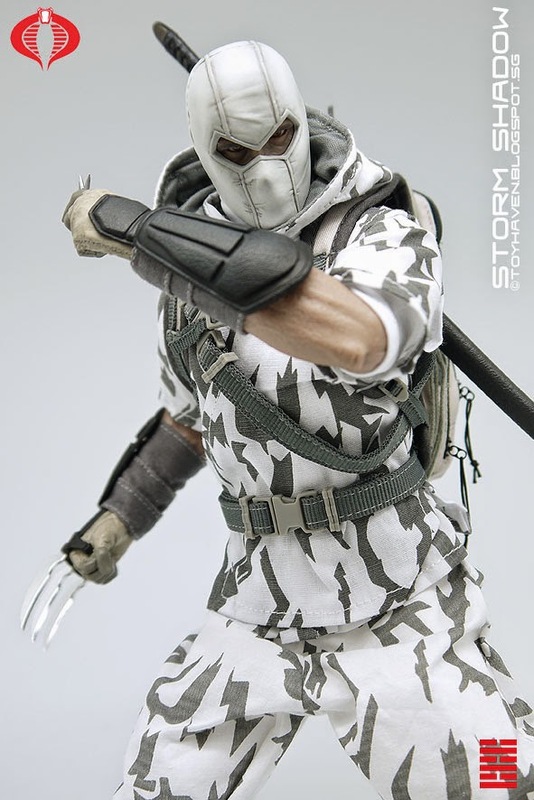 Minor issue which takes away a bit of the realism but not the FUN and collecting toys / action figures, as with any other hobby should be fun. Once any hobby becomes a form of investing and buying to sell, the focus shifts from being fun to being greedy and where's the fun in that. 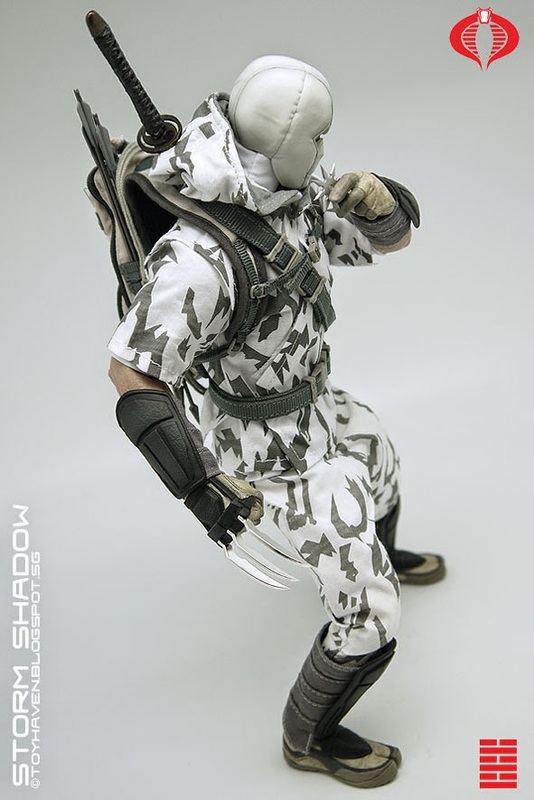 Here are some photos taken of Sideshow Collectibles "G.I. Joe: A Real American Hero" COBRA Ninja Assassin 12-inch Storm Shadow figure with his 1/6 scale shuriken. 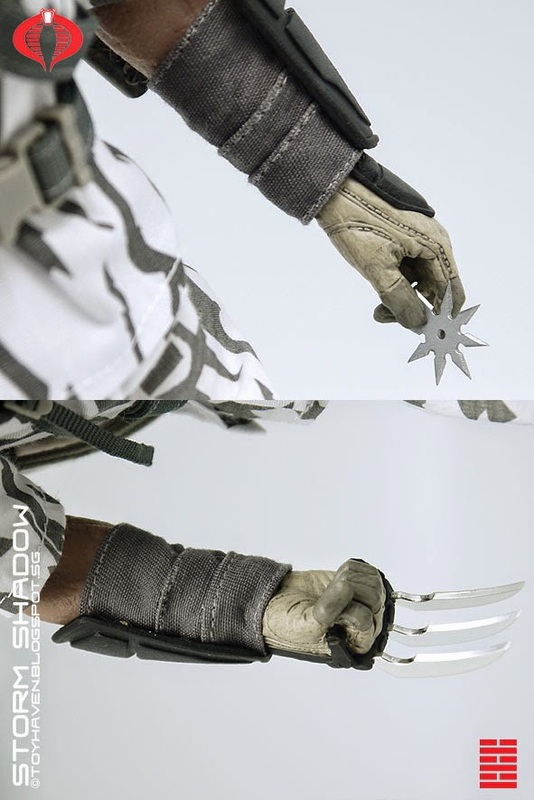 A shuriken (Japanese 手裏剣; literally: "sword hidden in user's hand") is a traditional Japanese concealed weapon that was generally used for throwing, and sometimes stabbing or slashing. 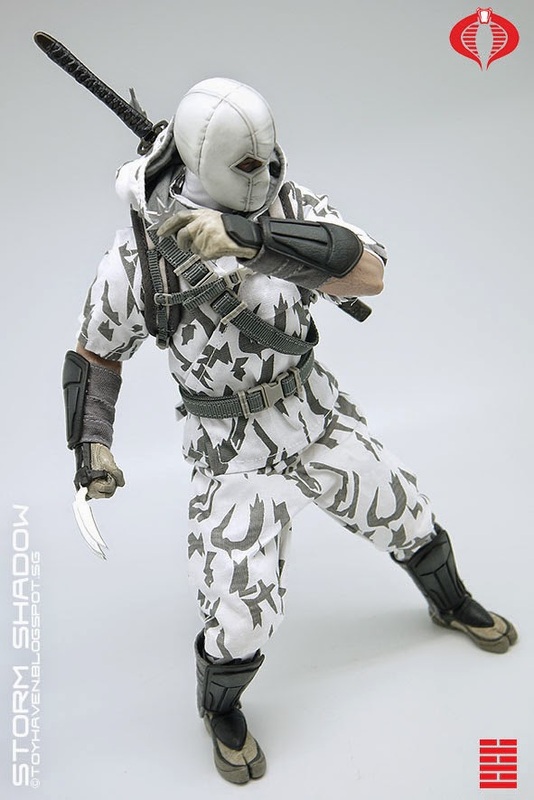 They are sharpened hand-held blades made from a variety of everyday items, such as needles, nails, and knives, as well as coins, washers, and other flat plates of metal. 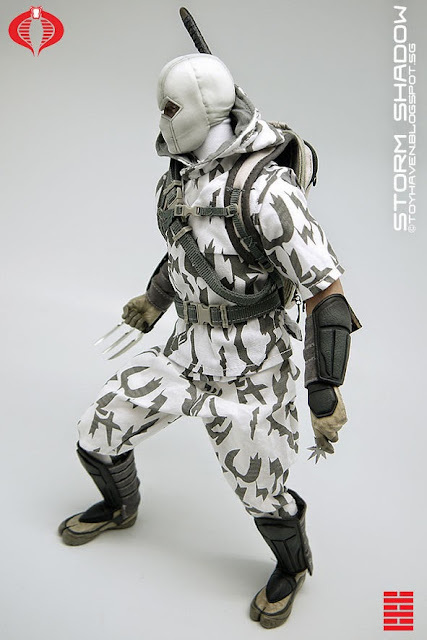 Shuriken is the name given to any small-bladed object, while shaken is traditionally used to indicate the well-known "throwing star" or "ninja star". 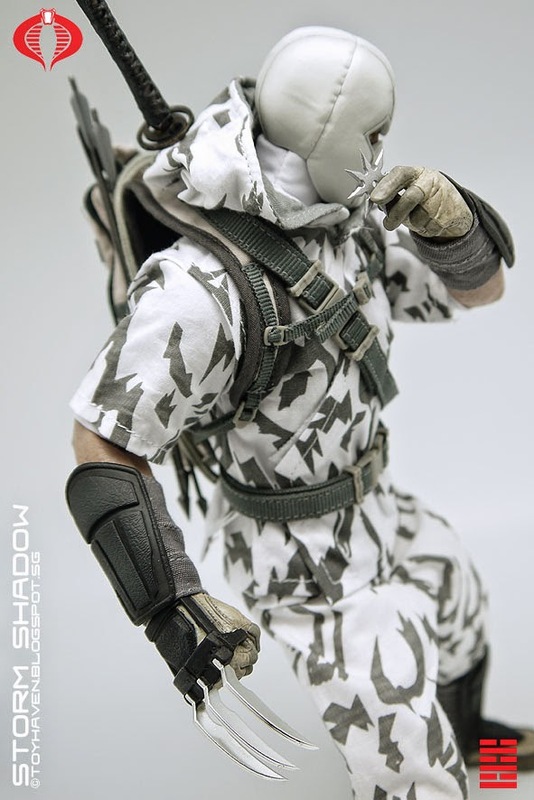 Solid review and great photos! The thickness of the mask is silly but this dude comes with so many weapons I don't care.